Minuartia nuttallii var. fragilis (Maguire & A.H. Holmgren) Rabeler & R.L. Hartm. Leaf: recurved. Flower: sepal ribs (1)3, +- equally prominent; petals 0.8--1.1 × sepals. 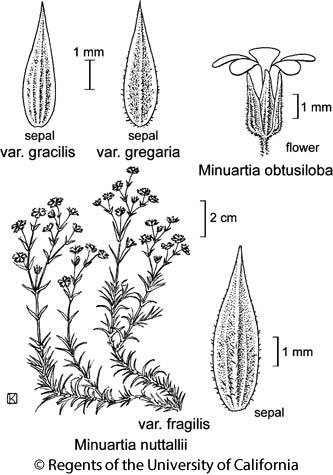 Citation for this treatment: Ronald L. Hartman & Richard K. Rabeler 2012, Minuartia nuttallii var. fragilis, in Jepson Flora Project (eds.) Jepson eFlora, http://ucjeps.berkeley.edu/eflora/eflora_display.php?tid=81387, accessed on April 22, 2019.